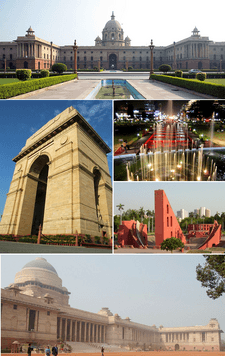 New Delhi (Hindi: नई दिल्ली) is the capital city of the modern Republic of India. It has a very old history. In traditional Indian geography it falls under the North Indian zone. The city has an area of about 42.7 km2. New Delhi has a population of about 9.4 mio. people. 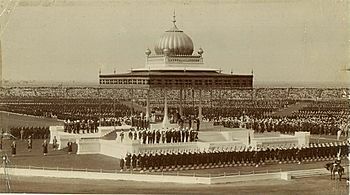 The Delhi Durbar of 1911, with King George V and Queen Mary seated upon the dais. 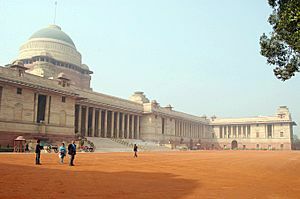 During the Delhi Durbar on 12 December 1911, George V, then Emperor of India, along with Queen Mary, his consort, made the announcement that the capital of the Raj was to be shifted from Calcutta to Delhi, while laying the foundation stone for the Viceroy's residence in the Coronation Park, Kingsway Camp. 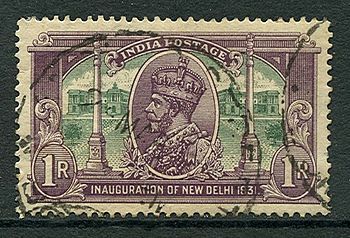 The foundation stone of New Delhi was laid by King George V and Queen Mary at the site of Delhi Durbar of 1911 at Kingsway Camp on 15 December 1911, during their imperial visit. 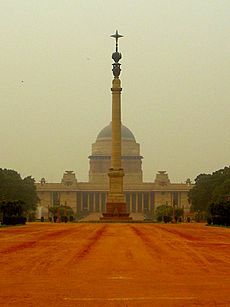 Large parts of New Delhi were planned by Edwin Lutyens, who first visited Delhi in 1912, and Herbert Baker, both leading 20th-century British architects. 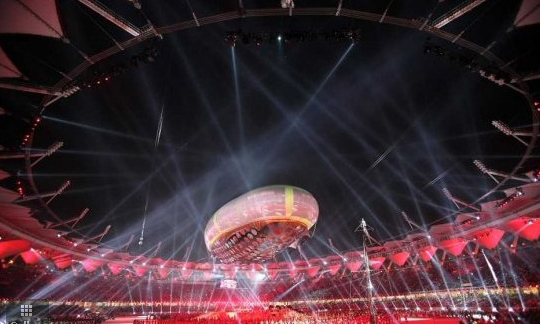 The contract was given to Sobha Singh. The original plan called for its construction in Tughlaqabad, inside the Tughlaqabad fort, but this was given up because of the Delhi-Calcutta trunk line that passed through the fort. Construction really began after World War I and was completed by 1931. 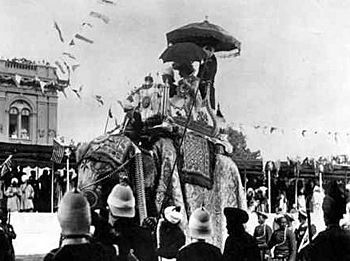 The city that was later dubbed "Lutyens' Delhi" was inaugurated in ceremonies beginning on 10 February 1931 by Lord Irwin, the Viceroy. Lutyens designed the central administrative area of the city as a testament to Britain's imperial aspirations. Soon Lutyens started considering other places. Indeed, the Delhi Town Planning Committee, set up to plan the new imperial capital, with George Swinton as chairman, and John A. Brodie and Lutyens as members, submitted reports for both North and South sites. The central axis of New Delhi, which today faces east at India Gate, was previously meant to be a north-south axis linking the Viceroy's House at one end with Paharganj at the other. Eventually, owing to space constraints and the presence of a large number of heritage sites in the North side, the committee settled on the South site. 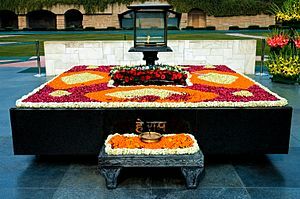 A site atop the Raisina Hill, formerly Raisina Village, a Meo village, was chosen for the Rashtrapati Bhawan, then known as the Viceroy's House. 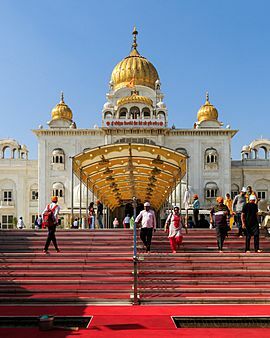 Subsequently, the foundation stone was shifted from the site of Delhi Durbar of 1911–1912, where the Coronation Pillar stood, and embedded in the walls of the forecourt of the Secretariat. The Rajpath, also known as King's Way, stretched from the India Gate to the Rashtrapati Bhawan. 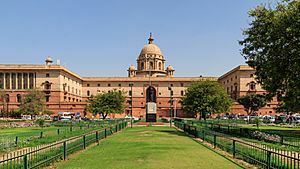 The Secretariat building, the two blocks of which flank the Rashtrapati Bhawan and houses ministries of the Government of India, and the Parliament House, both designed by Baker, are located at the Sansad Marg and run parallel to the Rajpath. New Delhi lies on several fault lines and thus experiences frequent earthquakes, most of them of mild intensity. 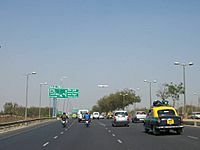 The climate of New Delhi is a monsoon-influenced humid subtropical climate (Köppen Cwa) bordering a hot semi-arid climate with high variation between summer and winter in terms of both temperature and rainfall. The temperature varies from 46 °C (115 °F) in summers to around 0 °C (32 °F) in winters. 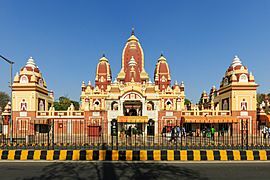 Except for Hinduism, the proportions of other religions are different and relatively lower in New Delhi as compared to entire NCT. According to 2011 census, Hinduism is the religion of 89.8%), Christians (2.9%), Sikhs (2.0%), Jains (0.4%). 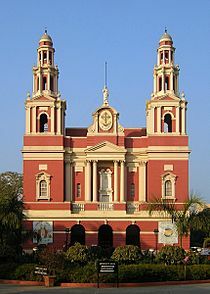 Other religious groups include Parsis, Buddhists and Jews. 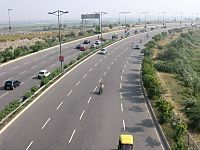 New Delhi is the largest commercial city in northern India. 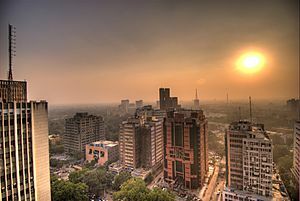 Connaught Place, one of North India's largest commercial and financial centres, is located in the northern part of New Delhi. The city's service sector has expanded due in part to the large skilled English-speaking workforce that has attracted many multinational companies. Key service industries include information technology, telecommunications, hotels, banking, media and tourism. Indira Gandhi International Airport, situated to the southwest of Delhi, is the main gateway for the city's domestic and international civilian air traffic. In 2012–13, the airport was used by more than 35 million passengers, making it one of the busiest airports in South Asia. In 2010, Indira Gandhi International Airport (IGIA) was conferred the fourth best airport award in the world in the 15–25 million category, and Best Improved Airport in the Asia-Pacific Region by Airports Council International. New Delhi is a major junction in the Indian railway network and is the headquarters of the Northern Railway. 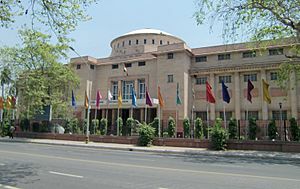 The five main railway stations are New Delhi railway station, Old Delhi, Nizamuddin Railway Station, Anand Vihar Railway Terminal and Sarai Rohilla. The Delhi Metro, a mass rapid transit system built and operated by Delhi Metro Rail Corporation (DMRC), serves many parts of Delhi and the neighbouring cities Faridabad, Gurgaon, Noida and Ghaziabad. The Delhi Metro is a rapid transit system serving New Delhi, Delhi, Gurgaon, Faridabad, Noida, and Ghaziabad in the National Capital Region of India. Delhi Metro is the world's 12th largest metro system in terms of length. Delhi Metro was India's first modern public transportation system, which had revolutionised travel by providing a fast, reliable, safe, and comfortable means of transport. New Delhi Facts for Kids. Kiddle Encyclopedia.